It’s always strange to see how genre literature is filtered through the sensibilities of other writers. Margaret Atwood’s Booker Prize-winning The Blind Assassin tells us of the planet Zycron, culminating in the war between a superstitious barbarian tribe and the advanced but corrupt city of Sakiel-Norn. However, it is presented as a story-within-a-story-within-another-story. This metafictional conceit allowed the novel to be taken seriously by the critics. Fortunately, the three-layered story is clever: According to Atwood’s book, heiress Laura Chase wrote a novel in 1945 before driving off a bridge in an apparent suicide. That novel, which hints at a real-life affair, includes the pulp story as the bedroom talk that a coarse Marxist revolutionary uses to keep the attention of a sheltered upper-class lady. The themes of each layer (real life, the novel about the affair, and the pulp story of Zycron) are reflected cleverly in the others. Meanwhile, newspaper clippings give details about major events in the lives of Laura Chase and her family, while providing tantalizing hints of the untold stories behind the news. By the mid-point of the novel, though, the stories-within-stories have lost steam. The fantasy about Sakiel-Norn is only ever interesting when it sets the scene, with a culture informed by real-world class struggles and a conflict that highlights the tension between the lovers in the middle story. But every time it is about to actually provide some plot or character-building, it rushes through the actual story in order to reach the next significant piece of scenery. Meanwhile, the book “written” by Laura is interesting only to the extent that it gives us a view of the real-life characters’ secrets. The idea that it could have become famous on its own, let alone remembered fifty years later, makes it harder to believe the otherwise realistic main story. By this time, the only truly interesting story-within-a-story is the one at the outer level. Iris, the sister to novelist Laura, is recounting the events of her life for us. The jumps between the elderly Iris’ current state, with her sharp wit and bitter outlook, contrast sharply with the young self she recalls: The only children of a successful industrialist, Iris and Laura were raised in privilege and never prepared for adulthood in an unforgiving world. The tragic trajectory is obvious (the book opens on the scene of Laura’s death) but the details are a compelling mystery. As always, Atwood’s prose is masterful. Iris’ tale finds the right turns of phrase to capture herself at all ages, bringing alive their small Canadian town, the culture of the early 20th century, and the adult world as seen through children’s eyes. The history of the Chase family is filled with mistakes and tragedy, but after a lifetime of experience, Iris’ portrayal finds compassion for all but a few villains who ruined her life directly. The story is unique. Laura is a strange child (possibly autistic? ), while Iris is quiet, distant, and seems to have no agency in the story she herself is telling. Their idillic, privileged childhood seems wrong from the beginning, and sets them on an unusual course through life. Iris’ unhappy arranged marriage dominates half of the book, but this book does not put feminism front and center in the way that Atwood’s novels like The Handmaid’s Tale did. It’s impossible to avoid a feminist angle when discussing this book, but it’s thrown into the mix along with many other elements. Chief among them is the mysteries of Iris and Laura’s lives, which are slowly revealed throughout the book. Though I complained that the inner stories (as well as the newspaper articles) aren’t very satisfying on their own, they do allow the secrets to be revealed in an interesting way: The reader receiving a high-level glimpse of the future from newspaper clippings, a few more hints from the elderly Iris’ comments and Laura’s novel, and finally the complete story when the flashback scenes catch up to that point. Even when the final pieces are obvious (as they are in the last few chapters), it is an enjoyable way to structure the novel. 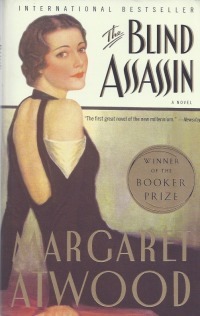 In short, though, the inner stories of The Blind Assassin mainly provide an interesting hook at the start. They never become satisfying on their own. The outer one features the interesting characters and compelling plot. Despite Atwood’s reputation as a respected author who isn’t afraid to work with science fiction and fantasy, it’s her rich vision of the real world that make this novel worth reading.